In scientific circles, they don’t call it the big toe. It is often referred to as the Hallux. This should give you an idea of which part of the body the conditions Hallux limitus and Hallux rigidus affect. Your big toe is extremely important to motion. It provides the support and propulsive force you need to walk and run. In the event of injury or dysfunction in that toe, many other parts of your body from your knees to your back will suffer. This is because they have to take on added stress when you are standing, walking or running. Hallux limitus happens when your big toe loses some of its motion and flexibility. You find that you cannot move the toe sideways or upwards without pain and stiffness. If the condition worsens to the point where all motion is lost or severely limited, we call that Hallux rigidus. Severe cases of Hallux limitus and rigidus may require surgery. But in many situations, physical therapy, toe stretching and pain relievers can be sufficient. Another thing that podiatrists strongly recommend is wearing the right shoes that give your toes plenty of space and allow your big toe to recuperate without stress. Here are the essential considerations experts say you should keep in mind when shopping for footwear. Hallux limitus and rigidus are idiopathic conditions. This means we don’t know what exactly causes them. But researchers have a few theories. One of them is that wearing the wrong kind of shoes could cause or contribute to Hallux problems. Specifically, shoes with a narrow toe box could cause gradual deterioration in the function of the big toe, causing it to weaken and lose its range of motion. So the first thing to check when buying shoes for Hallux rigidus/limitus is that there is a generous toe box. This ensures that your Hallux and other toes have enough room to splay and move. Generally, it’s a good idea to go for extra-wide shoes (not just at the toe box but across the full length) that will not constrict any part of your foot. With a weakened and painful big toe, your feet will be providing less support than usual. The body compensates by shifting some of the weight to joints and muscles in your legs, knees and lower back. That’s why these areas start to ache when you have Hallux limitus. A good shoe should provide the missing support, thus ensuring that other joints don’t take on the extra weight and shock when you are moving. Podiatrists recommend buying shoes with a forefoot rocker. The rocker reduces impact on your toes when you are walking or running. Essentially, it performs the work your big toe should have been doing – absorbing shock and providing propulsive force to help you walk smoothly. For added support, buy a shoe with both mid-sole and forefoot rockers. Finally, make sure that the insole is well-padded to absorb pressure and impact when you are standing, walking or running. At this point your feet are not at their best and any undue pressure on your feet could aggravate your condition. A comfortable insole allows you to carry on normally while still allowing your big toe to heal. In addition to having a wide toe box, these shoes are designed to stretch even wider if need be. Your feet will never feel constricted. A low heel provides just the amount of support and propulsion to take the pressure off your Hallux. Removable insole meaning you can insert your own orthotics. Ideal for Hallux limitus as well as bunions. The upper of this shoe looks deceptively normal. But put it on and you’ll discover its secret: it can really stretch. The upper is made from Elastane, a super stretchy material usually used to make hosiery and underwear. When you wear the shoe, the lightweight material stretches to accommodate your toes and feet. Lightweight and very stretchy. The upper is seam-free for full contouring. Also ideal for swollen feet, bunions, corns and extra-wide feet. With a wide fit, a soft comfortable padding and a low heel, these shoes meet all key considerations recommended by podiatrists. They are great if you spend most of your day walking or on your feet. Many customers also say they were amazing for their elderly family members with reduced feet mobility. Durable leather upper and gum rubber sole. Available in several colours including red, black, brown and navy. Extra wide fit ideal for different foot conditions including bunions and swollen feet. If you are looking for some comfortable sneakers, try these ones. They are quite wide and not just around the toe box but also throughout the length of the shoe. They are not only ideal for Hallux limitus/rigidus but also other conditions such as swelling, bunions and corns. The outer material is also flexible enough to expand should you need extra room. 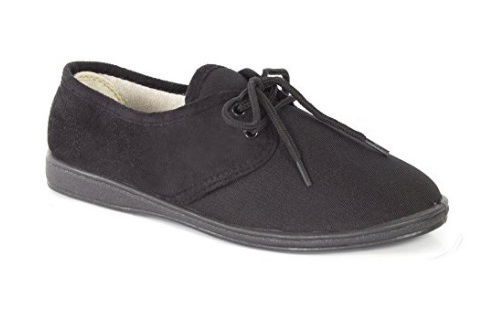 Soft inner lining that eliminates any friction point with your feet. This is important if your big toe is sore or in pain. Low heel and slight forefoot rocker for added support. Instead of the usual narrow apex, the toe box of these shoes gently curves in a wide arc from one side of the shoe to the other. Inside, this creates generous room for your toes to move in any direction. There is also a slight rocker at the front of the shoe to absorb shock and distribute weight away from your toes when walking. 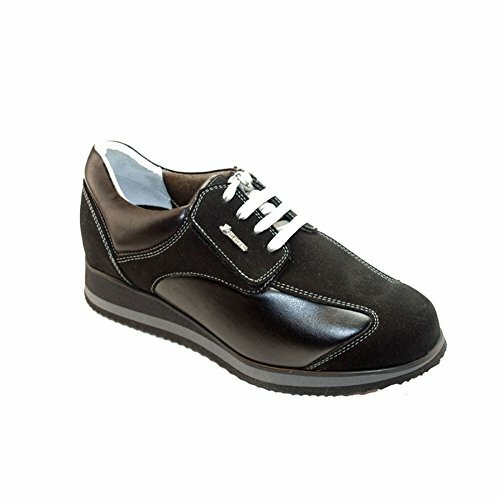 If you are looking for a pair of stylish formal or semi-formal shoes, the Hergos H 8101 shoes are a great choice. Wide fit from heel to toe. Low heel and forefoot rocker provides additional support when walking. What Age Do Your Feet Stop Growing? Best Socks For Sweaty Feet: Is There Anything Like That?